We provide a personal on-site visit and Feng Shui consultation for your home or business anywhere in the UK, Europe and worldwide. Over the last twenty years, we have worked with every type of home, office, shops, shopping centres, hospitals, care homes, restaurants, factories and many other business-related buildings, some straightforward and many that are incredibly complex. We consult with architects and developers for the design of architectural floor plans for construction and renovation. Interior designer’s proposals on furnishing and colouring as well as materials. Search for new homes or business premises, interior design, garden landscaping, business stationery, logos, advertising and so much more. Our resident Feng Shui Master, Practitioner, consultant, teacher, author and researcher Michael Hanna is one of the most sought after Masters in Europe and worldwide and has helped thousands of people from all over the world transform their lives for the better (read what some of our clients have to say?). A true measure of our success and knowledge is the fact that we are consultants and teachers to other Feng Shui consultants from around the world. As well as busy consultants we also founded and run the world famous International Academy of Feng Shui, attracting students and Feng Shui Practitioners from all over the world including the United Kingdom, United States of America, Canada, Thailand, Iceland, Spain, Ireland, Estonia, Switzerland, Singapore and Hong Kong, to name but a few. Over the last twenty-two years, we have built an enviable client base ranging from Princess’s, Ladies and Lords, Sir’s, Count and Countess’s, Doctors, lawyers, some very famous clients and some of the largest companies in the world. We have consulted on Manor houses, Mansions, flats, apartments, studio’s, mobile homes, homes in UK, USA, Canada, Thailand, Ireland, Scotland, Wales, Japan, Australia, Germany, Spain, Belgium, France, Bosnia, Hong Kong, Hawaii, Sweden, Holland, Greece, Dubai, Switzerland, Austria, Malaysia, companies employing thousands of staff, small and large restaurants, hairdressers, financial houses, brokers and even a fish & chip shop. You name the type of business we have probably done it, and regardless of the size of the building we are working with, the consultation is done with a passion for perfection. Our legendary monthly Feng Shui newsletter is widely read by thousands of Masters, Practitioners and enthusiasts from all over the world and it is one of the longest running (16 years) and regular (sometimes a little late) traditional and authentic Feng Shui monthly newsletters that carry no advertising and is completely free of charge. We regularly appear on the BBC and other channels, newspapers, magazines, we have won many awards and received more testimonials than you can ever imagine. ” I 101% believe you saved my life! I have been under the hospital for over 10yrs now and in the last 7yrs things have progressively got worse. This coincides with us moving to our present abode 7yrs ago, and that’s roughly around the time I started reading about Feng Shui and placing cures around our home, to help our diminishing funds and my health. A saying which appears to be of relevance here would be “a little knowledge is dangerous”, well it certainly was for me anyway, you see i was placing more or less the right things, just in the wrong places and of course our money situation got worse and so did my health, to the point that in May I was told there was nothing more my medical consultant could do for me and that MAJOR life changing stuff was on the cards. Feng Shui and Geomancy is a science and art of buildings, land, and their effects on health, wealth, relationship’s, career, business and an overall harmony in your life. Many books have referred to it as the “art of placement” and the belief is that all you need is a couple of nice expensive pieces of furniture with round edges, clear all your clutter and hey presto the money comes rolling in and romance blooms, there is some truth in this but it only plays a very small part. Feng Shui is a science and art that Masters in Asia spend a lifetime learning and their journey never ends. A good Feng Shui Master will use their skill’s to help people to achieve a better lifestyle, its not just about creating wealth, we actually put health first, then relationships and family harmony and wealth automatically follows, for some they will not read any further, sorry if its not what you want to hear, but if you balance health and relationships, wealth will follow. Having said all that we neither agree with the popular saying “money is not everything” unfortunately it is very important as no money coming into a home or business can cause health, relationship, arguments, worry and so many other problems. So it may not come top of the list, but it plays equal importance to other areas of your life in a consultation. We balance your whole life as opposed to concentrating on just one aspect, although we do focus on areas that you or we consider need enhancing. Feng Shui is about creating a harmony and balance in your life, whether you are a single person living in a one bedroom flat or a multinational company turning over millions of pounds, its no good if you have lots of money and cannot find love or good health, or one department in a business is supporting another because they cannot just seem to get it right. You need a perfect balance, and with a good Feng Shui consultation, you can achieve this. We have been personally using Feng Shui since 1979 and practising since 1988, and our journey has still not ended, unfortunately Feng Shui has become very commercialised over the years, and there are now many DIY books available, which give so much conflicting advice combined with so-called practitioners offering advice that can be dangerous, in our opinion. If you are suffering from Health problems, relationship problems, wealth problems, child development problems, Geopathic stress (sick building syndrome), or just overall bad luck. If so, a Feng Shui consultation can help you. Constant tiredness continued sickness and lack of drive. An overall feeling of bad luck. Obviously some of the above are normal day to day problems that most can relate to and don’t panic if you can relate to a few of the above, however, you will know if your Feng Shui is good or bad. 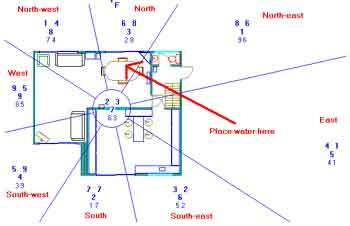 You may have read Feng Shui books where the author will tell you that you have to move your bathroom 6ft to the left or your front door 7 inches to the right. To the average person, this is just not possible, and most of the time is not required. Any good Feng Shui practitioner will be able to work with fairly simple and cheap cures, it may mean using a particular colour or placing an object, a piece of furniture or element in a certain area but it is very rare that we have to use expensive or inconvenient cures, such as rebuilding. The most you may have to do is erect a few fence panels, plant a few trees or move some furniture or bed placement; most cures will be of the five elements, which you will probably have in your house already. There are of course some very secret cures or enhancers we use but we will discuss this on the day, they will normally be used for sickness stars and enhancing wealth areas and believe it or not you could have up to 5-6 wealth areas that can be activated or you could even be blessed with a combination of ten or a pearl string combination making the whole house auspicious, however they need to be activated to be of use, a bit like having a Rolls Royce on your driveway without keys or petrol, it looks good but absolutely no benefit to you. Once I received your suggested cures and enhancers for the house were put in place within a few days. The effect was almost immediate. From being a tense and stressful place, the general feeling in the house was uplifted to a much more friendly and relaxed environment. However, the most significant change was to my health. A consultation normally takes around 4 hours (start around 11 am weekdays only), it depends on the size and complexity of the building and the number of people living or working in the building. There is no such thing as a standard Feng Shui consultation for any one person or property; this is where some people get confused with the books they read. You will be fully involved in the consultation and are invited to walk around with a tape recorder or notepad although you will have a follow-up written report from us the following week. It is better to have the cooperation of all primary members of the home or business, if you need us to not to involve other members of the household or employees of an office it is best to advise us beforehand, this is not uncommon to us and not a problem at all. Many times I have turned up to a business playing the part of an architect or insurance assessor for the day but we will only do this for a company and will not pretend to be an interior designer or such like in case your partner comes home early, this is not the best recipe for a productive day. The first part of the consultation is a little boring for you as it takes around 30-60 minutes to take compass readings, examine the home and land formations and calculate Xuan Kong etc; it then gets very exciting with full involvement from you. We will look at the exterior environment you live or work in, this an essential part of the consultation and often overlooked by many practitioners, any Sha Ch’i (negative energy) directed towards the building, trees, landscape etc. An analysis of “Form school” Feng Shui is then taken into account and this will tell us the type of problems you may be suffering from or indeed the right things. We will then take accurate directions using our range of some of the most expensive and accurate compasses in the world, we also ensure accuracy and double check with an electronic compass and also a hand bearing sighting compass (all calibrated to zone 1 UK & Europe unless we are outside of zone 1 where we use a different set of compasses calibrated for these zones), accurate to 1/3 degree, in total we use six different compasses as this part is very important. This may seem very extreme using six different compasses but an accurate compass direction is the most important part of a Feng Shui consultation, many Practitioners make the mistake of only using a Chinese Luo pan compass calibrated to Asia, this may look impressive and authentic but if it has not been calibrated for the UK & Europe it can cause the compass to be out by 5 degrees which can mean disasters in Feng Shui considering you have to work within 1/2 degree accuracy. A compass that has not been calibrated for UK, the needle will tilt and drag on the glass thus causing an inaccurate reading. Finding the facing direction of your home, often mistaken to be your front door location; this is not always the case as this part of the consultation sometimes can take some time. By this stage we can generally tell you what problems you are experiencing as directions and placement of your building and environment will tell us what sort of problems you may have, whether it be health, relationship or wealth. We will then go on the inspection of the property and grounds where you will be advised of colours, placement of furniture or objects and use of the five elements. The end result of a good consultation will be very subtle changes using all of the above, the property will not look forced or unnatural. We do not offer a “new age” style of Feng Shui; there are no prayers, no rituals, ceremonies, bell ringing, chanting or anything else that you may feel uncomfortable with. The consultation is also a learning experience for you on traditional and authentic Feng Shui. The whole process is done in a very relaxed and friendly way, yet at the same time remaining professional and discreet at all times. 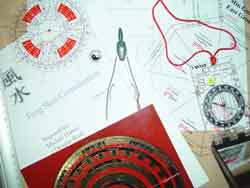 Our overall investment on consultation use compasses is over £3500.00 (three thousand pounds) and in my opinion, this is probably the largest investment any Feng Shui Master has ever made. This does not include our vast collection of antique Chinese Luo Pan’s and also our compasses used in southern parts of the world where the declination of compass readings differ to our northern part. Why tell you about our investment? I do not tell you this to impress but to show the level of care and paramount importance we take in ensuring accuracy and also to be aware of Practitioners who turn up with a £10.00 compass bought from the local camping store. Over the years we have even heard of Practitioners turn up without a compass and using an A-Z map to find the compass readings. The two major investments are the Francis Barker hand built and made to order compasses accurate to ± 15 minutes (1/3 degree) and incorporating prism sighting system for highest accuracy These alone cost over £1700.00 which may seem extreme but bearing in mind the compass reading of any building in Feng Shui is the most important part of any consultation it cannot be compromised. 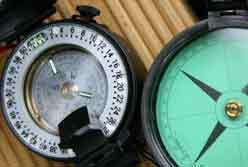 Two of the compasses are dry compasses that use no fluid to dampen the needle/plate as this offers more accuracy. This part may surprise you as not many people are aware of it but we also use a Francis Barker compass that uses 6400 mils (divisions) (normally only used by the military) and not the usual 360 degrees. This type of compass offers even more accuracy as once converted from mils it splits the degrees of the compass into fractions thus giving even more accuracy when dealing with buildings (fairly common) that fall within what is known as “dead lines” these are buildings that face between two mountains (compass directions) an example would be 157.5 degrees is this south or southeast? Each direction will have its own natal chart and if you use the wrong one it will cause the occupants many problems. Then you have on each direction what are known as mountains, there are three in each compass sector meaning that south, for instance, is split between three 15 degrees (total 45 degrees) mountains each one giving a different natal chart and energy flow. So there are actually three different south’s; north’s, northeast’s etc. This is an authentic Feng Shui and mistakes cannot be made. Each compass is calibrated every month to ensure further accuracy as they can easily become corrupted from storage and electrical equipment. Another vital addition is the use of a specially made non-magnetic tripod. 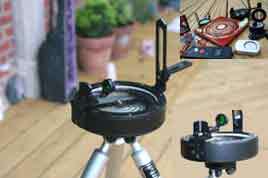 It is vital that any tripod used with a compass be non-magnetic – even wooden tripods often have metal screws and ball sockets and will corrupt a compass reading. Again we have even seen well-known websites selling normal camera tripods for use with their compass; this can throw a compass reading out by 30 degrees or more. Some of the compasses including Luo Pan and non-magnetic tripods used on consultations. An essential tool for every consultation. The most common indications of Geopathic stress (GS) are resistant to treatment (conventional or alternative), feeling run down and exhausted, depression, nervousness, pallor, allergies, insomnia, restless sleep, migraine, feeling cold, cramps, tingling in arms and legs, sleepwalking, grinding teeth, nightmares, fatigue, feeling of someone looking over your shoulder, headaches on waking or fuzzy heads or just a feeling of bad luck (“it always happens to me”). GS can cause miscarriages, behavioural problems in children and infertility. Geopathic stress, sick buildings syndrome, black lines, Radon gas, Lung Mai (earth meridian) whatever we call them, they exist. Recently we have been called out to more consultations than ever relating to Geopathic stress and related problems. A good Geomancer will know how to cure them. It is an art of “dowsing” and using earth’s acupuncture to cure them. Geopathic stress has been found to be the most common factor in most serious and long-term illnesses and psychological conditions. Research suggests that 85% of people that are suffering ill health are sleeping in a Geopathic Stressed area. What exactly is Geopathic Stress? Geopathic Stress (GS) or harmful earth rays, is natural radiation which rises up through the earth and is distorted by weak electromagnetic fields created by subterranean running water, certain mineral concentrations, fault lines and underground cavities. The wavelengths of the natural radiation disturbed in this way become harmful to living organisms. As part of your consultation we dowse for GS and cure them leaving you with powerful white lines, you would be amazed at the change in atmosphere once these are cured, you will be encouraged to dowse for them yourself before and after removal, there is no additional charge for this even if we have to take a few hours extra as I believe with a power to cure these black streams cannot be charged as an extra that someone may not be able to afford, Follow this link for more details on Geopathic stress. “Had someone told me I would be turning to Fung Shui after 23 years in business I would have laughed, what can I say, my wife (a loyal fan and customer of yours) persuaded me to have a consultation, I will never ridicule her again, what a difference you have made. It took me weeks to convince (yes they did all laugh at me) all our directors (they were even more “stuck in the mud” than me) but they are so glad we went ahead now; my only regret is we didn’t have it done 20 years ago. Not only has business increased the atmosphere in the factory is so much better and the whole event seems to have rubbed off on all 27 employees. Thank you so much (a thank you doesn’t seem adequate given the results). Answer: (Master Joseph Yu) No. Feng Shui has no religious background. Some “Feng Shui masters” claim to have learnt Feng Shui from a Buddhist monk. This is not credible. A real Buddhist is prohibited to practice Feng Shui and all kinds of fortune telling. Feng Shui is an unconventional science that has theoretical results supported by unverified statistical data. The task of Feng Shui students in the future is to integrate Feng Shui into conventional science. To claim that there is a more powerful transcendental part of Feng Shui is nothing more than deceitful marketing (End). Fortunately nowadays most people will have a floor plan of some description and will combine this with the comprehensive written report, this will ensure no mistakes can be made after our visit, 99% of Practitioners ask their clients to try and remember what has been said on the day of the consultation and any mistakes you make can cause devastating results for you, one inch out can cause you to take advice from your Practitioner to place water in an area that has a 5 sickness star which would cause ill health and very bad luck for all the family. If you were going for brain surgery would you expect the surgeon to ask you to mark where you would like him to drill a hole? You will also receive a Flying Star chart, which will tell you which part of your home or office that will need activating or deactivating. You will receive a detailed report on each sector an important part of your home or office i.e. Wealth, health romance etc and how to enhance this, which colours are suitable for you as an individual and all your family or staff. A full list of what is included in your consultation is listed below. Your supplied floor plan showing all 8 compass directions. Everyone in the home or office will be told their best directions to face when working, sleeping, studying etc. You and your family’s Chinese animal and prediction for the year. Michael and Lillian Too at her home in Kuala Lumpur Malaysia 2001. 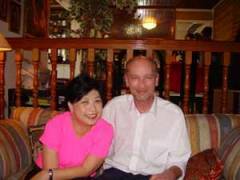 Michael was born in Hong Kong in 1958, married to Josephine (the owner of this site) for 38 years with two wonderful children, one of which Daniel has worked with us for over ten years and very highly regarded in the Feng Shui world. Michael has travelled the world many times over and his longest journey, Feng Shui began in 1979 and since then he has been greatly honoured to have been personally trained to Master Practitioner level in Malaysia by world-famous Lillian Too, Master Yap Cheng Hai Feng Shui Centre of Excellence, Master Joseph Yu and UK’s leading authority along with hundreds of books and still taking time out to further study this vast skill, all are exceptionally highly regarded and experts in their field, although some practice slightly different styles (same schools) of Feng Shui which has been a major advantage for Michael in his practice as the balance between them all has enabled him to practice a traditional, classical and also modern approach to this intricate art. We have thousands of satisfied clients and are proud of the reputation that we have built over the years. So many times I have heard horror stories with regards to so-called Practitioners turning up at clients houses without even a compass let alone a basic understanding of this complicated science, so please be careful when selecting a practitioner as there are many people trying to cash in by reading a couple of books or taking a quick online course. Be aware of a practitioner asking for an analysis of your life and your problems before he/she meets you, a good Feng Shui practitioner will be able to tell you what sort of problems you may be experiencing just by looking at your home or office and checking the “Flying Stars”, a bit like going to see a fortune teller, you wouldn’t want to give too much information regarding your personal life beforehand, you would expect them to tell you. We provide consultations for homes or business big and small, designing new buildings, renovations and alterations, problem-solving, search for new homes or business premises, interior design, garden landscaping, business stationery, logos, advertising and so much more. What don’t we need from you? We do not need to know any personal details about your life good or bad other than above. Many consultants ask for your life history and want to know every problem you may be experiencing, a good Practitioner will be able to tell you what has been going on in your life just by studying your surroundings, landforms and taking compass readings. So the least you tell us the more entertaining and informative the consultation will be. Obviously, any areas in your life that you wish to have enhanced you can advise us on the day. Home/business on-site consultation or online? A home or business personal visit consultation will always be better than a remote online one. However, although we are very realistic about our prices for some this may still prove expensive and for this reason, we have perfected our online consultations. For further details please visit this link. England, Wales, Scotland & Ireland. Barking, Battersea, Beckenham, Bethnal Green, Bow Gree,. Bexleyheath, Crayford, Brent East, Brent, Brent North,Brent South, Brentford, Isleworth, Bromley, Chislehurst, Camberwell & Peckham, Carshalton & Wallington, Chingford, Woodford Green, Chipping Barnet, City of London & Westminster, Croydon, Croydon Central, Croydon North, Croydon South, Dagenham, Dulwich, West Norwood, Ealing Acton, Shepherds Bush, Ealing North, Ealing Southall, East Ham, Edmonton, Eltham, Enfield North, Enfield Southgate, Erith, Thamesmead, Feltham, Heston, Finchley, Golders Green, Greenwich, Woolwich, Hackney North, Stoke Newington, Hackney South, Shoreditch, Hammersmith, Fulham, Hampstead, Highgate, Harrow, Harrow East, Harrow West, Hayes, Harlington Hendon, Holborn, St Pancras, Hornchurch, Hornsey, Wood Green, Ilford North, Ilford South, Islington North, Islington South, Finsbury, Kensington, Chelsea, Kingston, Surbiton, Lewisham Deptford, Lewisham, Lewisham East, Lewisham West, Leyton, Wanstead Mitcham, Morden, North Southwark, Bermondsey, Old Bexley, Sidcup, Orpington Poplar, Canning Town, Putney, Regents Park, Kensington North, Richmond Park,Romford, Ruislip, Northwood, Streatham, Sutton, Cheam, Tooting, Tottenham, Twickenham, Upminster, Uxbridge, Vauxhall, Walthamstow, West Ham, Wimbledon. All areas covered from Dublin to Belfast. is it possible that i download “Annual subscription for Annual and Monthly Flying Star analysis” from your site , if yes where should i go ? Thank you for the lovely words about the website! We do not currently offer online consultations although we will be introducing this in the next few months. If you like, I can add you to the mailing list for this. I would suggest looking at the links below as this is the best place to start and can help you make the most out of all areas of your life. I hope this helps, Gloria and hope that things get better for you. I bought the business kit a while ago. My question is regarding the “Dragon Red Shou Shan Stone (DR4)”, directions you sent with it says I should put it in the middle of the house but the middle of my house is an emoty floor space. I can’t put a table in there too as it’s the adjoining space between the dining and living room. Any other place I should put it? this is used for my home business. I would place it on a shelf up if possible. I would not suggest placing it on the floor. If you cannot place it here, I would place it on a desk for support. Thank you Daniel! Truly appreciate your fast responses. Looking forward to a better 2019! I’m just getting used to this website apologies if vie sent this message in previously. I have had a lot of illness and financial loss over the last 6 years. I have bought the Dui Qu Lung wealth Talisman to protect or enhance any financial loss of money. Unfortunatley have nowhere in the centre of my house to place this can you advise where else in the home I can place this. the front door of my house is facing West and the back is East where my bedroom is. I’m sorry to hear you’ve been experiencing problems. If you can, I would use a bit of tape or blu tac to place the Dui Ou Lung talisman in the centre. You could also hang it from the ceiling if you prefer. I would like to know what is the best position for aquarium in 2019? I have 2 aquariums and I put them in the east side of the house? Would that be okay? The safest place for an aquarium for 2019 is in the centre. I would avoid placing it in the east as this will weake n the good #6 star located here for the year. If you have to use indoor water in 2019, the best area is in the centre as this will help to activate the auspicious #8 star for the year of the Pig. Water can also be placed in the West for future wealth. Regardless though, it is better to seek professional advice before placing any water feature inside or out as in Feng Shui it is the catalyst to good and bad so please take care and consult or use our software. If you decide to use water inside your home or around the outside during 2019, it is vital that you make sure that you keep the water clean at all times and that it is flowing water as this is very different from using stagnant water. Do not let the water stagnate as this can cause Qi to become trapped and bring Yin energy which can stop positive Qi entering the home or office. Using water in Feng Shui is a very powerful tool and is the essence of Feng Shui (Shui meaning water). The Qi around the home or office is caught by the water and is then cleansed and distributed around the building provided the water is clean and flowing. If you look at our resource pages, you will find more detailed information on water placement for 2019 and beyond. Thank you so much for your help and advice! I am planning to get my roof fix this year, would this be a better year to do it? Just wanted to let you know that I received my enhancer and cure kit for 2019. It is my first time to purchased the kit. They are all beautiful. I purchased the talisman cards too for my mom, dad , siblings and I will give them for the Chinese New Year! May I know the best protection for my husband 1977 (snake) and myself 1981 ( rooster) for 2019 year of the pig that I can purchase from your site? I’m glad to hear your cures arrived safely! For a roof repair, there is rarely an ideal time to do this so I would just go ahead with it and make sure you have your cures in place. The best thing I can recommend is the cures kit, which you already have. If you are looking for your protection animals, yours is the Dragon and your husbands is the Monkey. I hope this helps, Cristy. I wanted to buy the Arowana fish but sadly its sold out of you’re store. A a friend has kindly bought me the Arowana fish made of brass. I a bit worried about putting it out. as its measures larger than the one you have. Please can you advise me on whether this will be alright. length is 4 inches the with 1.9 inches including the brass coins is . I would place the brass Arowana fish in the west for 2019 to enhance the #1 star. The metal will work well to enhance the water star. Thank you for the advice on the placing of the Brass Arowana fish. The front entrance of my home is in the west. and the back is east, We have had great financial worries and a lot of ill health the last five years. I was a bit concerned about the dimensions of the one that was bought for me as the one you have on your website is smaller. and I could not get one due to them being sold out. I have two wealth toads that I would like to use and the Master cure also. I am unable to place the Master cure in the centre of my home there is nowhere suitable please can you advice me of anywhere else I can place the master cure. If you cannot place the master cure in the centre, you can place it in the west for 2019. What colour are the wealth toads? I have noticed that the #4 scholastic star is in the South this year, and my only toilet is right in the South sector. Is there are remedy for this? Both my children are university students. I would still treat this area with the appropriate cures this year and try to keep the bathroom door open when possible to energise this area. I live in 70 Carroll Avenue, Apt. 1003 in Rhode Island, US. I have read that number 4 in any possible combination isn’t very auspicios, I definitely feel stuck in every aspect of my life which makes me very sad. I also read that you suggest to draw a circle around the number, I did it but there hasn’t been much change. Please Michael suggest me something else, I want to move forward in life with my baby. I appreciate any help you can give me. If that hasn’t done much good, I would recommend taking a look at the Flying Stars in your home for the year as this could be causing problems. I hope this helps, Diana and hope things get better for you. My brother is in Colombia, he is opening a business but he has a box of electric meters for the building next to his business on the Northeast and underground transformers with conductor conexiones on the East. Michael what cure would you suggest ? Please help us, he wants to succeed . Thank you for all the help you can offer us. How exciting for your brother and wish him every success. I would introduce some water colours like shades of blue into the east and fire colours like shades of red, pink, purple or burgundy into the northeast, both of these colours will dissipate the negative energy for the year. Of course, you can use the annual cures and enhancers but if funds are tight I would use the element colours. If you email us at jo@fengshuiweb.co.uk we will be able to give you more information and a quote for a price. We will be releasing online consultations next week on the website which will cover everything about the home and how to make the most out of it for the occupants. If you like, I can let you know when we release this on the website. First of all, I would like to thank you for the informative pages that you have provided about Flying Star Feng Shui. 1. Entrance door of my apartment is located in Earth Star 3, Facing Star 1, Sitting Star 7.. And, now in 2017, Annual Star 5 is flying to that sector. 2. Bedroom of my mother is located in Earth Star 5, Facing Star 8, Sitting Star 5.. And, now in 2017, Annual Star 7 is flying to that sector. Already, health of my mother is not good. I am worried about these two things. If you can provide some insight and solution to tackle with these situations, then it can be so kind of you. Thanks. With regards to the entrance door area i would introduce some blues, black or grey and the easiest way is using a door mat (no reds or fire colours). Your Mothers bedroom it is harder when you have a 5-8 combination as you would normally place metal to weaken the #5 star although this can weaken the prosperous #8 star as they are both the same element and as the sitting star affects health for your mother, i would place a brass Wu Lou beside here bed as this element whilst metal can balance the energy and it such a lovely symbol of good health. Take care anfd have a wonderful year. Hi, I live in a L-shaped house, south east facing front door (116 degrees) in New Zealand. My Kua number (2), as well as that of my partner (8), Mother (5) and Father (8) (yes, my parents live with me). Is this a problem? No this is not a big problem, you would basically treat the missing sectors as not being there and will not suffer problems if bad stars are there and also wont benefit from the good stars that may be there. I have read some of your wonderful explanations of fengshui and I’m a believer and would really appreciate your help in the matter. Im tui, born on 12th of October 1983 and I’m planning to get a place, and i think that the house is (north east) facing (thats where the main entrance was and thats where you would take a picture of the house but its been closed and changed to north/northwest) but the busiest is the rail way tracks which are sitting at the south east of the house and the road with parking spaces there too ??? From what you\’ve told me, I would say that the facing direction would be the north east although if you like, you can send me your address privately and I can take a look on Google Maps for you. I\’m afraid we do not have any local consultants although Michael travels to the US regularly. If you are interested in a quote, please let me know. Good morning. I want to confirm if there is really no cure for me. I\’m born on October 23, 1959 and is now engage in piggery but breeding only. I was informed by a fung shui expert that I should stop this business asap as this will lead me to more misfortune. Is this true? I would not take notice of the advice personally. Feng Shui can help find relevant jobs but not jobs that will bring problems to you. I want to know if February 12 is an auspicious date to move in to a new home. Thanks a lot. Are there any Feng Shui Consultations in the Boston, Massachusetts area? I am afraid I do not know of any local consultants to you but Michael has been over to America many times to Consult; you can use the contat form below to request a quote for a Consultation if you wish.